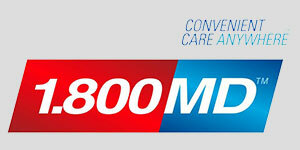 Faison Group has partnered with 1-800MD to offer telemedicine! As a nationally recognized telehealth provider, 1-800MD has a network of	board certified physicians that can diagnose illnesses, recommend treatments	and prescribe medications when appropriate to its members over the telephone,	through secure bi-directional video and email. 1-800MD provides fast and convenient access to quality medical care 24	hours a day, 7 days a week and 365 days a year throughout the United States. 1-800MD is a convenient and inexpensive alternative to non-emergent Emergency	Room visits, non-critical care clinics, or when you don’t have access	to your primary care provider. 1-800MD saves time, saves money and provides members with peace of mind.